I am in love with Korean radish. They are sweeter and crunchier than any radish I have tasted. 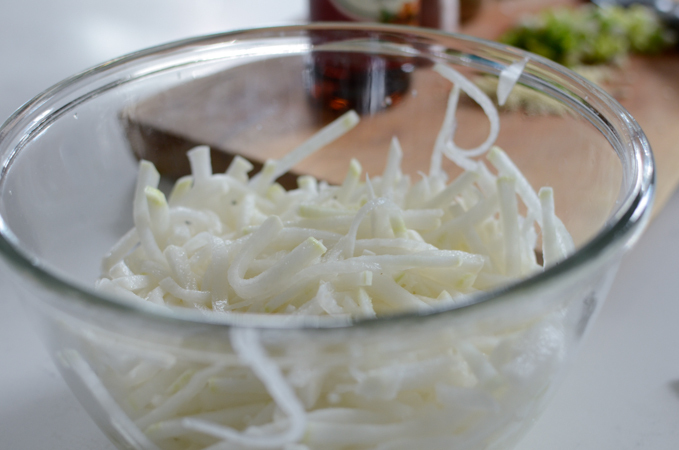 That means it is perfect to make salad, and I like to enjoy my radish salad in a rice bowl. 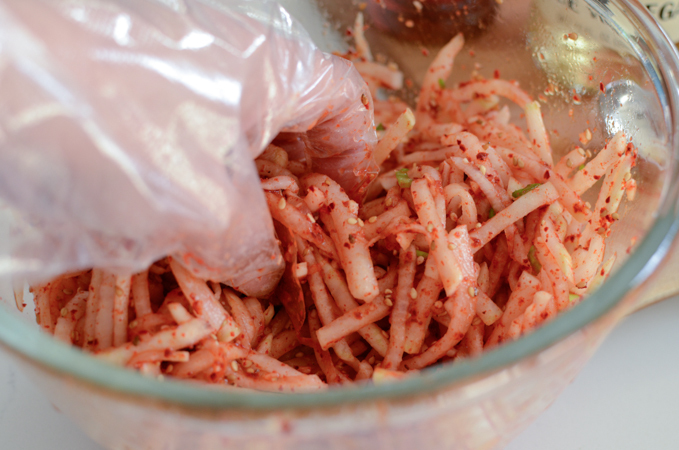 “Moo-sangchae (무생채)” is the popular Korean radish salad side dish that most Korean people love. It is easy to make and so delicious. You can make the salad in advance and store in the refrigerator for several days. Amazingly the radish will still hold the crisp crunchy texture after many days. Yup, that’s Korean radish! This rice bowl is one of the simplest Bibimbap you can make with only one vegetable and it is oh-so-delicious! Peel the skin off from the radish. Slicing the Korean radish into thin matchsticks can be tricky. 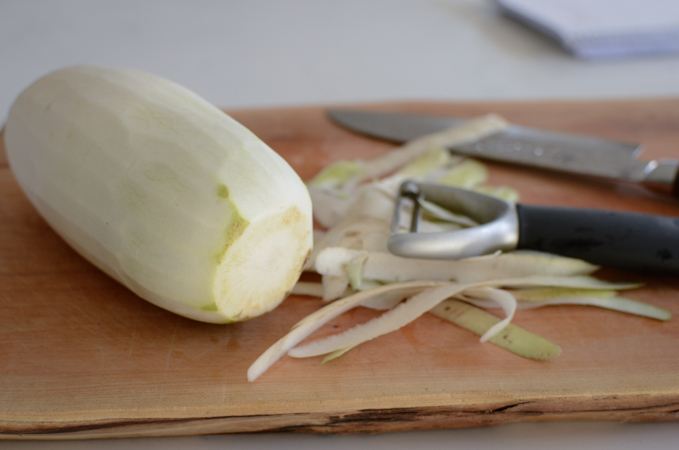 If you are not comfortable with the knife skills, you can use mandolin to do the job. Sprinkle a little amount of salt and toss together. Let it sit for 5-10 minutes then drain the water that came out from the radish. Get the rest of the crew ready. Oooops! Looks like the vinegar is missing from the scene. Dump them in a mixing bowl. Then mix! With your hand, of course. Taste it and adjust the seasoning for your liking. You can chill the salad for however long you desire at this point. 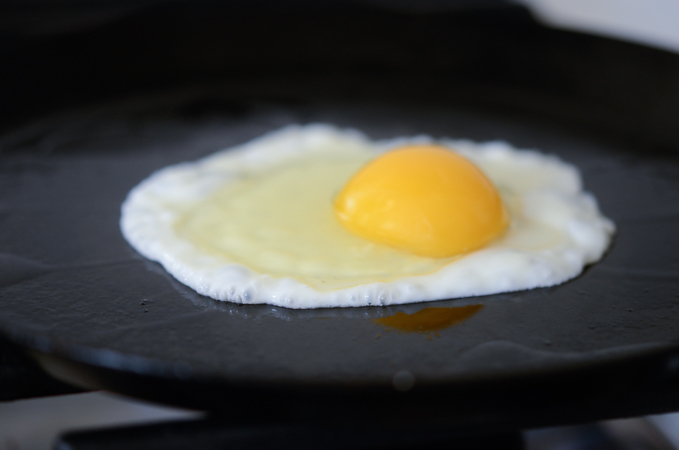 When ready to eat, fry-up an egg. 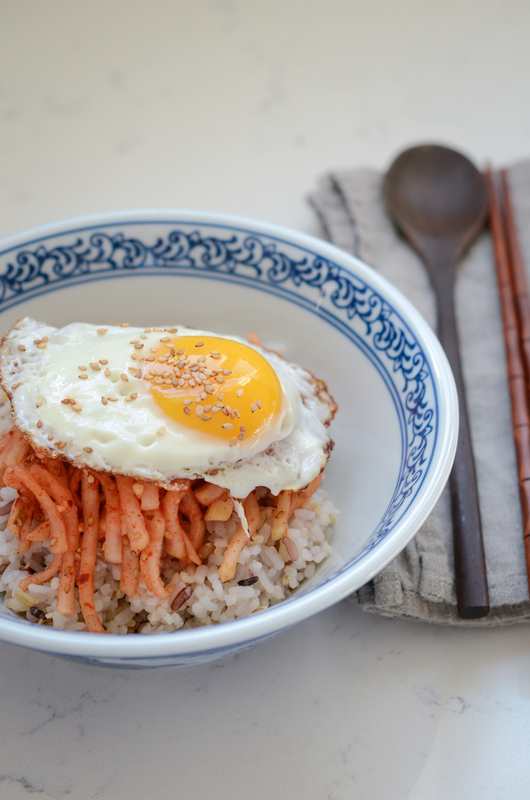 Build your rice bowl, simply rice, radish salad, and fried egg. That it. 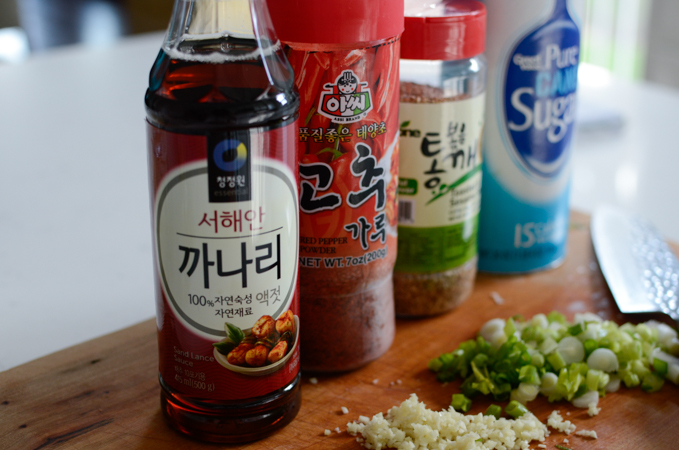 You can throw a spoonful of Korean chili paste if you like. I didn’t need for mine. Mix it up like crazy and shove a spoonful into your mouth. You will love the taste and the texture. I guarantee that you will love this simple meat-free meal. 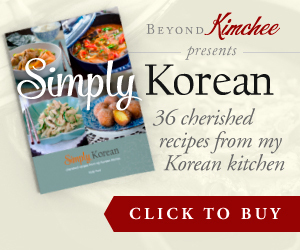 So hurry up and get a handsome looking Korean radish at the Korean store. They have pale green bottom with creamy white top, and shorter and chubbier than daikon radish. I am just describing the Korean radish to you in case you haven’t seen it before. 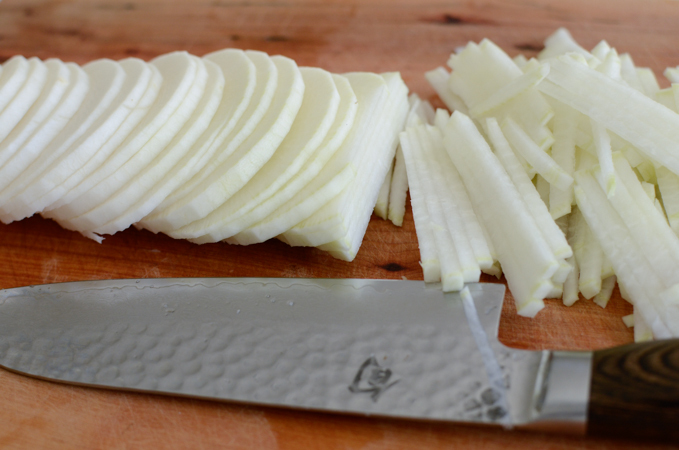 Peel the radish and slice very thinly, about 1/8-inch thick, then slice them into 1/8-inch matchsticks. Put them in a mixing bowl and sprinkle with salt. Toss and set aside for 5-10 minutes. Drain all the liquid that came out from the radish. 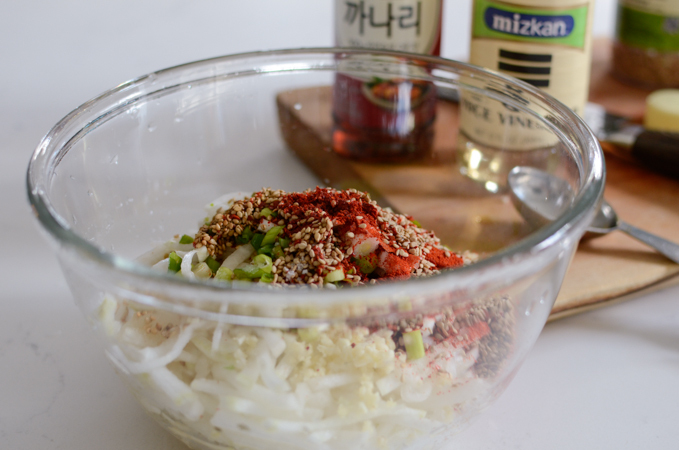 Add the rest of the ingredients into the bowl except the eggs and rice, and toss with your hand to incorporate the seasoning into the radish. Adjust the seasoning according to your taste. Chill the salad as you wish. 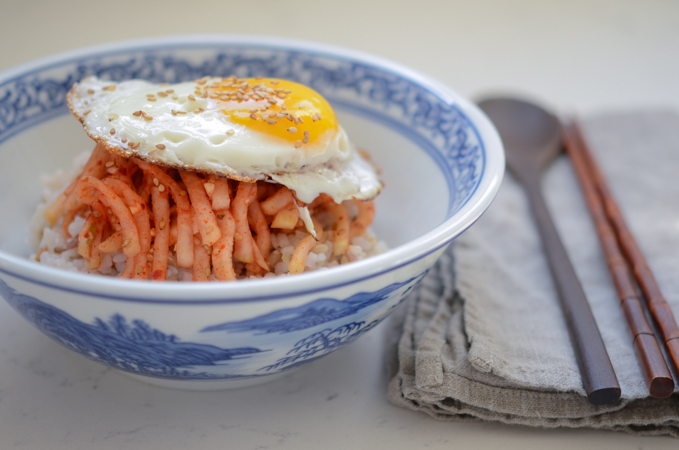 To serve, assemble rice and radish salad in a shallow serving bowl and top with a fried egg on top. Mix it up with chopsticks and serve with a spoon. I love, too. By the way, have you ever tried this with beet? Do you think it will be good too?